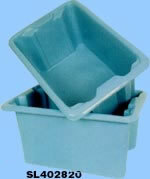 TOTE BOXES These handy lugs are molded of heavy duty polyethylene for long, rugged service. Our design permits stacking while in use, and is nestable when empty. Curled flange for easy handling. Available in colors for contents identification.